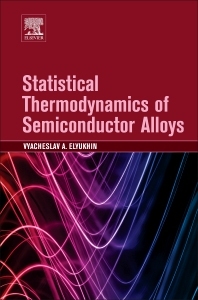 Statistical Thermodynamics of Semiconductor Alloys is the consideration of thermodynamic properties and characteristics of crystalline semiconductor alloys by the methods of statistical thermodynamics. The topics presented in this book make it possible to solve such problems as calculation of a miscibility gap, a spinodal decomposition range, a short-range order, deformations of crystal structure, and description of the order-disorder transitions. Semiconductor alloys, including doped elemental semiconductors are the basic materials of solid-state electronics. Their structural stability and other characteristics are key to determining the reliability and lifetime of devices, making the investigation of stability conditions an important part of semiconductor physics, materials science, and engineering. This book is a guide to predicting and studying the thermodynamic properties and characteristics of the basic materials of solid-state electronics. Professor Vyacheslav A. Elyukhin obtained a PhD in 1981 from A. F. Ioffe Physico-Technical Institute in St. Petersburg, Russia, with a thesis on the Physics of Semiconductors and Dielectrics. Since 1999 he has been a reseacher at the Centro de Investigacion y de Estudios Avanzados del Instituto Politecnico Nacional in Mexico. He has published 85 articles in international scientific journals.